WheelWorks provides young participants across Northern Ireland with access to training from professional artists using the latest technology and software; developing each young person personally and creatively, contributing to their growth as a person and an artist. Artists are encouraged to work collaboratively to nurture and develop crossover art forms between traditional and digital creative means. This ensures each participant the opportunity to experience an exciting, pioneering workshop. Their vision is to forge new creative and inclusive spaces that empower and inspire young people to express what matters to them. Groups that Wheelworks work with included disengaged young people, disabled young people, young people with dyslexia and dyspraxia, young people from rural settings and young people from a secured army welfare centre. The funded project ran under two strands; The ArtCart project and the Multiple Realities project. Wheelworks were awarded £3,500 from Halifax Foundation NI towards running costs for this. Emphasis is based on reachability and the main vehicle for this, in every sense of the word, is their ArtCart, a state of the art mobile arts activity vehicle. 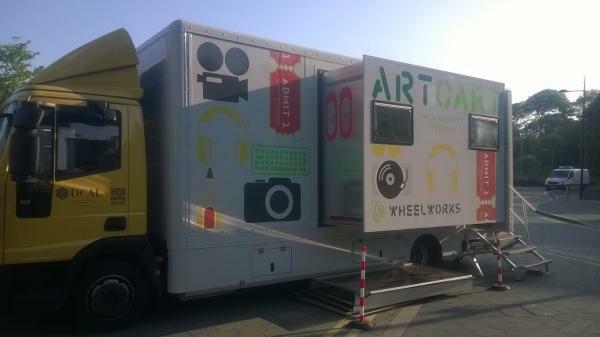 The ArtCart is Wheelworks unique dedicated mobile arts resource: a purpose built vehicle featuring a darkroom, sound recording studio and digital music, photography workstations with all the latest software and stage facilities. It delivers both projects and taster workshops and is especially popular at festivals and events across Northern Ireland. The vehicle is fully accessible and needs no electricity supply, so no location is out of bounds. With the funding provided the ArtCart was able to travel to five different communities in Northern Ireland, including Newry, Lisburn, Belfast, Cookstown and Magherafelt and provide training from professional artists to develop each young person personally and creatively, contributing to their growth via the arts. Multiple Realities is an accredited arts led cultural development programme where young people are targeted from Section 75 communities. The funding provided by the foundation allowed Wheelworks in partnership with Maghery Youth Club to encourage young people from this area to explore their identity and issues of importance to them. The main emphasis of this programme was to help them reach their full potential and doing this in a fun and exciting way using the arts as a tool for learning. Through this project, Wheelworks has been allowed to build meaningful partnerships with various groups across Northern Ireland. Some of the groups have expressed a keen interest in future activity with WheelWorks on both taster and sustained projects. The groups that participated in these activities have expressed a desire to develop a sustained partnership with WheelWorks. One group, Newry Shamrocks, have already completed an 8 week Multiple Realities programme thanks to the partnership formed during this funded project. A representative from Wheelworks stated “We cannot thank the Halifax Foundation NI enough for their continuous support during the lifetime of this project, and in doing so helping all those groups of young people involved in the project, Thank you again”.